In two of the seminal arthouse triumphs of the so-called Romanian New Wave, the theme and imaging of food are made conspicuous by their absence. Child’s Pose (2013), a study of a rich family which opens at a birthday party, features characters who seem to consume nothing but fancy coffee, cigarettes and sweet foreign liqueurs; 4 Months, 3 Weeks and Two Days (2009) portrays an exchange economy in which low-level black-market bartering supplies most daily needs, but food is only discussed and barely shown in two scenes and remains mostly rejected by the main character. In both these films, the lack of consumption of real nourishment serves to emphasize the sterility of the respective societies portrayed—modern-day Romania in Child’s Pose, and the Ceausescu era in 4 Months. Child’s Pose is about the loss of children; though the aftermath of Barbu’s accidental killing of a child drives the storyline, his mother Cornelia also contends with emotional estrangement from her thirty-two-year-old “boy”, refusing to recognize the strangling effect of her love even as she tries to protect him from prosecution. She remembers him as a fond, warm-hearted child with a “beautiful body”, an image hard to reconcile with Bogdan Dumitrache’s portrayal of a looming, bitterly pessimistic, uncommunicative man. The transmission of knowledge, ethics or love from the older to the younger generation is sorely lacking; we see only a hint of it in a brief scene in which an experienced soprano tutors two promising singers in a master opera class (a performance that Cornelia is forced to interrupt when news of Barbu’s accident reaches her). Cornelia and her husband offer little to their son in terms of comfort but merely try to skew the system in his favour through bribes and obstruction. When they do give him something to eat, the meal consists of a bottle of coke and a presumably delivered pizza. This sterility between the generations is repeated metaphorically in the replacement of sustenance with anti-anxiety drugs, lotions, cigarettes and alcohol. When Cornelia induces a mutely acquiescent Barbu to sleep at the parental home, her most convincing show of affection is to spread ointment on his bare back where he had been beaten by the slain boy’s family. But even this gesture uneasily blends the clinical and the sensual: Cornelia snaps a rubber glove over her hand before touching him, then proceeds to massage his spine and buttocks. Food is not offered, only pills and topical salves. Foodways — connections between food, culture and tradition — seem to have simply dried up or been poisoned out of existence by an influx of depressants and stimulants. 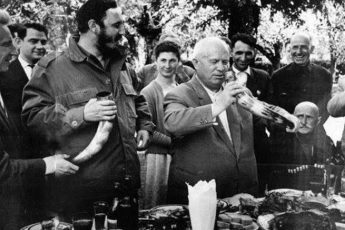 That Cornelia’s drink of choice is Grand Marnier, Bailey’s, Cointreau or other sweet foreign liqueurs might furthermore be seen as suggesting that this alienation is exogenous in origin, but of course, Netzer and his co-screenwriter Razvan Radulescu never display this sort of jingoism. Rather, Cornelia’s preference for French or English elixirs may be a condemnation of her replacement of “culture”, in its elitist sense, for any kind of real moral nourishment. This interpretation is supported by her gift of Pamuk and Müller books to Barbu, not because she enjoyed them or has anything to say about them but because their authors won prizes. The exchange between older and young has become so meaningless as to be, so to speak, empty calories. This has warped Barbu’s personality to the point where he is terrified of anything “unsterile,” including, it is implied, the possibility of new children. Food in 4 Months, 3 Weeks and 2 Days does not constitute a major theme, but the film does focus on a kind of sterile exchange of goods. In the beginning of the film, Otilia hurries throughout her dorm, exchanging for soap and cigarettes. The exchange system, as Otilia and her friend Gabita discover to their horror, extends even to abortions, as both girls are forced to sleep with the doctor in order to procure the procedure. This indictment of totalitarianism is interesting for not showing authoritarian crackdowns, such as that on contraception and abortion, but rather their effect on the illicit markets, in which women must use their own bodies as objects of barter. Of course, Otilia’s classmates’ system of exchange is infinitely more benign, and even seems marked by altruism and complicity (as when a young stranger gives Otilia a spare ticket to avoid her being fined on the bus). Yet oddly enough, this informal economy among the students does not seem to encompass food or drink. Nourishment appears in 4 Months only in two scenes after Gabita’s abortion, and in both, partaking in food seems to represent a kind of acquiescence with callousness. Against her wishes, Otilia leaves Gabita’s side to attend her boyfriend’s mother’s birthday party. (The fact that the mother is played by Luminita Gheorghiu, who as Cornelia celebrates her own birthday in Child’s Pose, is another connection between the two films.) There, the camera centers on her pale face as the older people discuss traditional recipes for potatoes and Easter eggs. Otilia nibbles but mostly smokes and leaves before the meringue specially prepared by the mother. When Otilia returns to the hotel, she must dispose of the fetus Gabita has left in the bathroom. Despite her promise not to “just dump it”, she panics and does just that. She returns to find Gabita in a restaurant. Gabita has ordered off the menu of the wedding next door. The food arrives; a plate of organ meat. Otilia seems to recoil in disgust and asks only for mineral water; Gabita takes the menu and studies it. A long pause ensues until Otilia turns toward the camera and the film abruptly ends. The second food-related scene is more mysterious. The fact that the girls are served the “leftovers” from the wedding carries some symbolic weight; as single, childless women, they are deviants from what is valued in their society. There is also a queasy parallel between the organ meats that Otilia cannot stomach and the sad detritus that she has just secretly thrown away. If this case can be made, then by implication, Ceausescu’s Romania is a society devouring its own children. 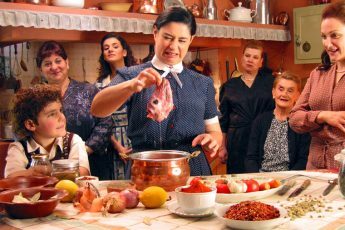 It is hardly surprising that these two films, both lauded representatives of new Romanian cinema, carry similar themes concerning food. Razvan Radulescu was a consultant on the script of 4 Months as well as the co-screenwriter of Child’s Pose. Luminita Gheorghiu, Vlad Ivanov and Cerasela Iosifescu all play somewhat similar roles in each film. 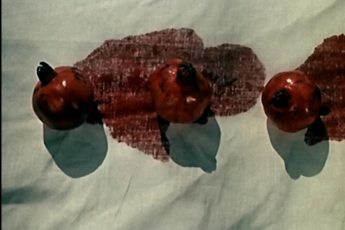 The carefully structured long-take realism of these two works does not, of course, represent the entire spirit of the new film scene; oddly enough, the high metaphorical film When Evening Falls on Bucharest or Metabolism uses the most direct references to food and digestion to represent the artistic process. Together, though, the two more realistic films portray two types of corruption of foodways: total sterility, with nourishment replaced by medication concomitant with perversion of moral family relations; or accepting a meal as acquisition to humiliating traditional roles.